Here is an exceptional insight into the unique ironwork created by today’s artist-blacksmiths. Over 250 color photographs display details of contemporary iron objects, including flowers, grape clusters, leaves, small and large animals that attest to the blacksmith’s role as a sculptor. There are amazing scrolls, folds, twists, textures, and weaves not normally associated with the hard material. With heat, hammer, talent, and muscle, the modern artist-blacksmith is forging exciting forms that permeate our surroundings. The casual viewer may often overlook details of small elements used to create a magnificent whole. 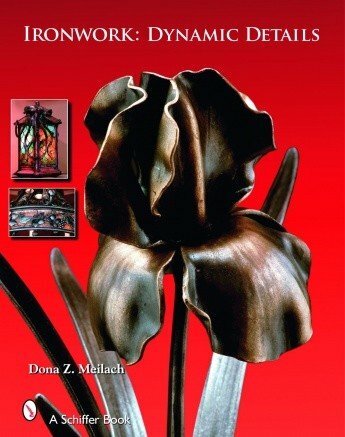 Dona Z. Meilach shows how focusing on the iron details of flowers, leaves, and amazing critters makes ordinary fences, gates, and chandeliers extraordinary. Functional joints become beautiful elements for furniture, fireplace accessories, candlestick holders, and other iron items we use daily. 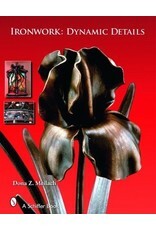 Dona’s approach will open one’s eyes to “see” and respect this burgeoning art form.This stimulating book is a must for metalworkers, designers, artists, gallery owners, art lovers, and museum directors.